DVD Player for iPad to Play DVD Movies on iPad? DVD Player for iPad Available? How to Play DVD on iPad? Is there a External DVD drive that I can hook up to my Ipad? Let me answer your questions. Firstly, there is No DVD player for iPad currently available for directly watch DVD movies on iPad. Secondly, there is No external USB DVD drive for iPad DVD playback. All of these because iPad has no DVD slot so that DVD won't play directly on iPad unless you view digital copies of DVD on iPad after DVD conversion. Without DVD player for Macbook, iPad iPhone, we can still import DVD movies on iPad with a solid iPad DVD ripper - MacX DVD Ripper Pro, which is designed to help you rip and copy DVD to iPads (iPad Pro, iPad mini 4, iPad Air 2, etc.) with MP4, MOV, M4V (H264/MPEG-4) formats in 1080p, 720p HD no quality loss & 5X real time speed. Thus, you can watch DVD movies on iPad anytime anywhere you want without format restriction. 1Import DVD Disc or DVD Folder or ISO image. To rip DVD to iPad, the first step is to load DVD movie. This iPad DVD ripper accepts three forms as input formats, DVD disc, DVD folder and ISO image. 2Select Output Format from "to iPad Video". On the pop-up windows, pick out "Apple Device"→"to iPad Video"→9.7-inch iPad Pro; iPad Mini 4; iPad Air 2 all here standby. Attention shifts to "Browse" button to opt for a target folder to save the output DVD files. 4Begin to Rip DVD to iPad Device. Click "RUN" button and this DVD ripper for iPad's DVD ripping engine will go into action to rip DVD to iPad iOS device. Just a cup of tea time, you will eventually get DVD playback on iPad. This method might be rarely known by people, but it's really a nice choice to view DVD movies on iPad without iPad DVD player. That is: record DVD movies to computer with a screen recorder Mac and then transfer the DVD movies to iPad with no quality sacrificing. 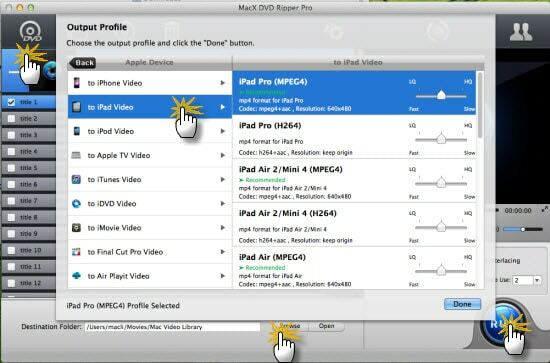 To record DVD movies to computer, you need a on-screen movie recorder - MacX Video Converter Pro, which enables you to 1:1 record DVD movies to computer in HD when you play DVDs on computer. And after DVD movie recording is over, you can also choose to convert recorded DVD movies to iPad supported MP4 MOV M4V formats and then transfer recorded DVD movies to iPad without any third party help. All the process can be finished in two parts: record and convert. Free download this DVD movie recorder HD on Mac or Windows computer. Then hit the "Screen Recorder" button on the main interface. Here you're suggested to set the DVD movie capture settings, including "Keep full screen" or "Record region"; adjust frame rate, audio device, target folder, count down, etc. And in a bid to ensure the recorded DVD audio is kept originally, it's advisable for you not to adjust the audio settings lest the unexpected heightened volume would hurt your hearing. Step 3: Start Record DVD Movies on Screen. Click "Start Record" button and this screen HD video recorder will begin to record DVD movies on screen when count down turns to be zero. Step 4: Convert Recorded DVD Movies to iPad iOS. After the DVD movie recording is accomplished, you can apply this screen recorder to convert the recorded DVD movies to iPad iOS devices (iPad, iPhone, iPod and more Apple device profiles offered). Actually, the two ways to transfer DVD movies to iPad, each has its own merits. The 1st way is more easy to handle, just a click away and then you can play DVD movies on iPad with 480p or 576p without DVD player for iPad. The 2nd one is a little bit more complicated, record & convert, two steps. But when you record DVD movies on screen, the output quality of DVD movie is much higher, HD 720p or 1080p, which is more suitable for Retina display iPad. Take a look at the best free DVD player for Mac review. Follow the detailed Mac DVD player comparison and know how to play homemade and commercial DVDs on Mac (El Capitan and macOS Sierra) with success in case your DVD player not working on Mac computer. MacX DVD Ripper Pro is the best DVD ripping software which can freely remove any DVD protection and rip/convert any new copy-protected DVDs to iPads (iPad Pro, iPad mini 4, iPad Air 2, etc.) with 36X faster speed & original quality.